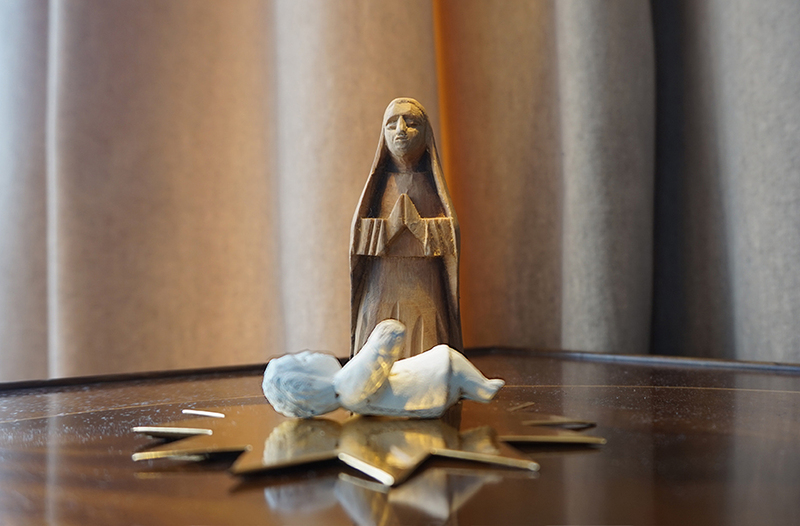 In the Nativity pageant, light appears to have been directed from the Star through a gap in the stable roof down to the figures of the Virgin and Child, who is lying on a sunburst (see East Harling image). These photos record some possible effects using sunlight and metallic-paper-covered reflectors. All the photos except (3b) were shot in overcast sunlight, indoors but next to a south-facing window, with no artificial light added. 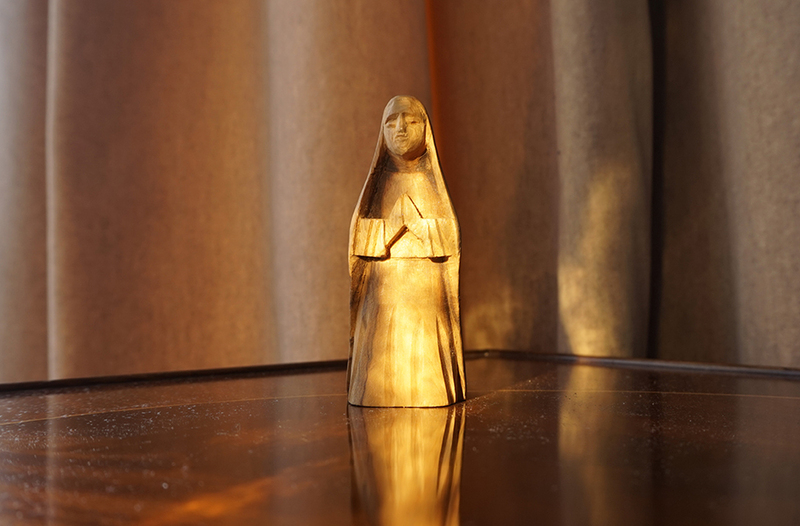 The colour of the wooden figure makes it easier to see reflections and the effect on shadows. The results suggest that the Star would have to be carefully angled, possibly on a swivel, to produce the optimum effects. Scroll down to see all examples. Diagram and further discussion. (1). 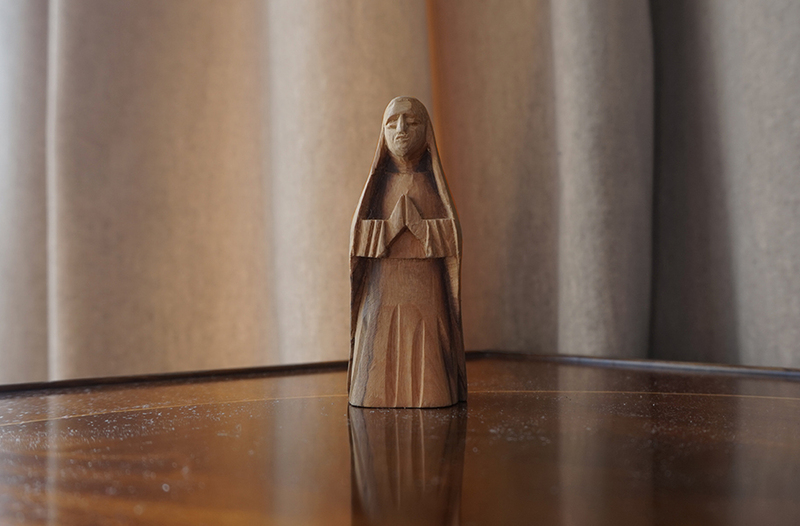 Starting point: wooden figure 9.5cm high, general ambient daylight indoors, no reflectors, curtain between direct sunlight and figure to reproduce possible lighting conditions in roofed waggon. (2). Virgin in same position. 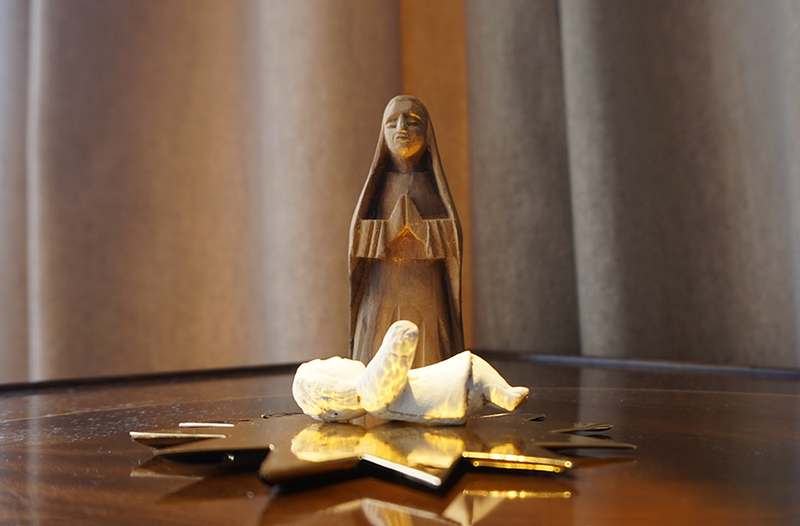 Wooden figure of Child, painted white, lying on gold-paper-covered cardboard sunburst. General ambient lighting. The camera is compensating  note the colour of the curtains compared with (1)  but the white paint on the child and the gold foil on the sunburst reflect slightly upwards onto the Virgin figure. (3). Same positions as (2). Sunlight coming through window reflected from a slightly larger gold-paper-covered cardboard star down onto Child and sunburst from almost vertical angle. The main secondary reflection is seen on the underside of the Child (the dappled effect is due to irregularities in the gold paper adhering to the cardboard beneath), but the Virgin is highlighted from above, and also from below (see underside of arms and veil, with slight sparkle). This effect would presumably also be created by strong ambient light out of doors. (3b). Confirmed. Taken on a brighter day with Virgin facing the sun. Direct light, only reflector under the Child. The effect is much more marked than on an overcast day using the larger primary reflector. The star-shaped pattern is reflected very sharply on her skirts. This assumes that the Child would be in sunlight and the Virgin in slight shadow under the stable roof, as in the usual iconography. It also suggests that in bright sunlight, no further boost from the star would be necessary, though the effects could be sensational. This configuration depends on the waggon facing the sun, which on-site in York is not always the case (see my article Part Two). Most of the following images assume that the sun is behind or at the side of the waggon, and the star towards the front of the roof, but other configurations are possible. (4). Same positions as (3). Sunlight through window reflected, but reflector angled to produce stronger reflection on sunburst. The white-painted Child almost seems to glow. 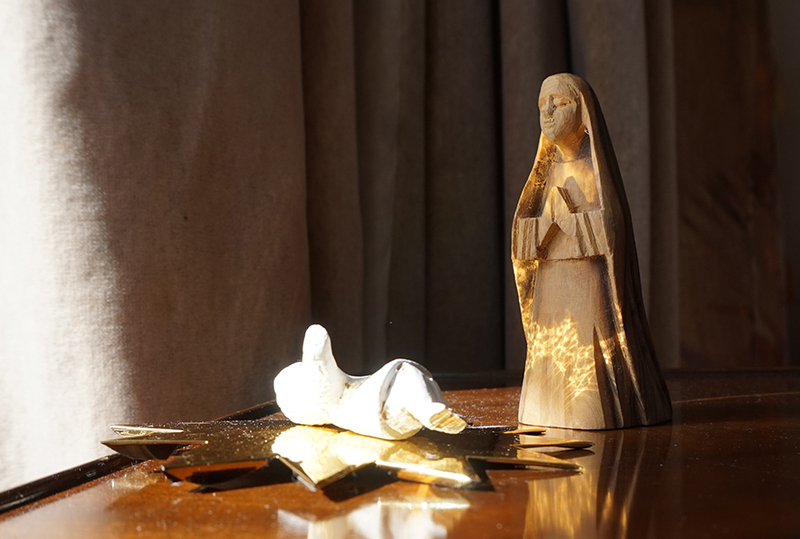 The Virgin is uplit by reflection from the sunburst. (5). Same positions as before. Primary reflector angles sunlight onto sunburst to produce optimum secondary reflection on Virgin. (To get the full effect an actor would have to be looking down at the Child.) The dappled pattern is produced by unevenness in the surface of the sunburst where it has been stuck to the underlying cardboard. It is exaggerated by the angle of reflection. (6). Virgin same position as before, Child and sunburst removed. Primary reflected sunlight angled directly to produce spotlight on Virgin. 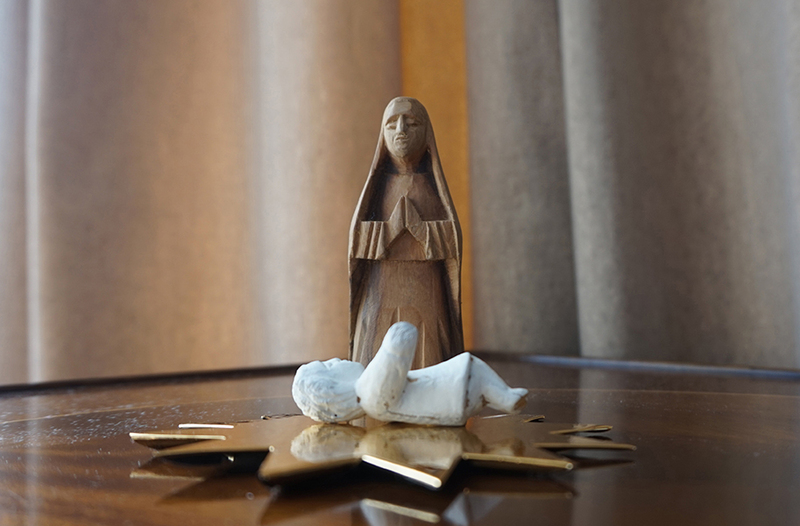 This is the main technique used in the Transfiguration. 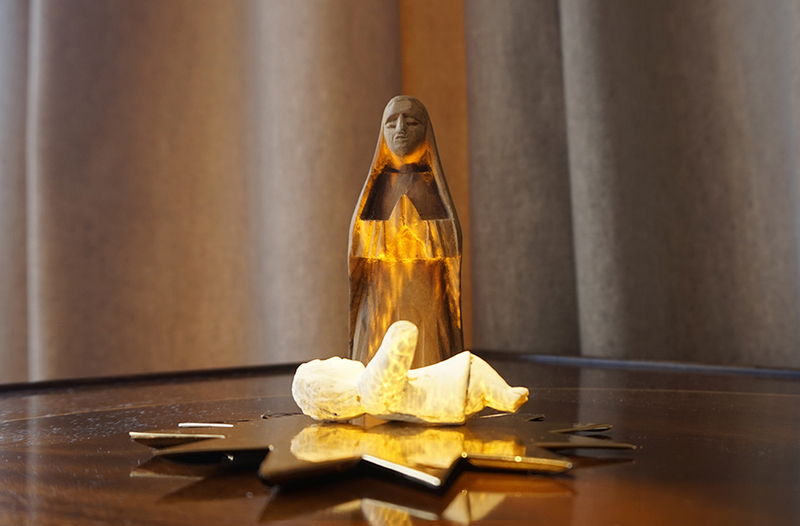 Go to the next section for a repeat of this experiment using a figurine made of different materials.